Accepted Scientific Name: Pereskia aculeata Mill. Gard. Dict., ed. 8. s.p. 1768 Mill. Origin and Habitat: Pereskia aculeata is is widely distributed. 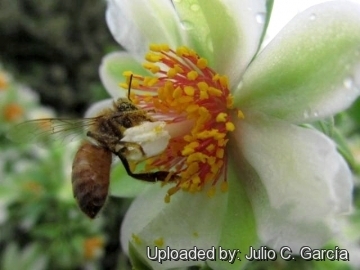 It has been recorded from Brazil (Maranhão, Pernambuco, Alagoas, Sergipe, Bahia, Minas Gerais, Ceará and Espírito Santo), eastern Paraguay, eastern Argentina (Bonaire, Sint Eustatius and Saba), Venezuela (Miranda, Carabobo, and Distrito Federal, Falcón, Zuliá, Táchira, and Bolívar), French Guiana, Guyana, Suriname, Panama,Central America, the Caribbean (Cuba, Curaçao, Dominican Republic, Dominica, Haiti, Lesser Antilles and Trinidad and Tobago,Saint Martin (French part); Sint Maarten (Dutch part)), northern South America and in Florida in the U.S and Mexico, but perhaps only as an escape. It was once recorded from Peru. The species is also cultivated and an aggressive invader in parts of the world where it has been introduced. Altitude range: It occurs from sea level to 1,200 metres above sea level. Habitat and Ecology: This species occurs in humid to sub-humid evergreen forests on inselbergs of gneiss or granite and also on limestone. The plant is often seen growing over vegetation and rocks. Capuchin and brown howler monkeys feed on the fruits of P. aculeata, and in some regions of Brazil they are its main dispersers. This species is common and widespread. The population trend is decreasing at the same rate as the forest in which it occurs; however, the species is still quite abundant. This plant is a declared weed in South Africa where it does extensive damage to forest areas by smothering indigenous trees. The plant has a tendency to form large, impenetrable clumps and the spines on the stems make control of large infestations difficult. The plants can regrow from leaves or pieces of stem. Pereskia aculeata var. lanceolata Pfeiff. Pereskia aculeata var. longispina (Haw.) DC. Pereskia aculeata var. rotundifolia Pfeiff. Pereskia aculeata var. rubescens Pfeiff. Pereskia foetens Speg. in Weing. 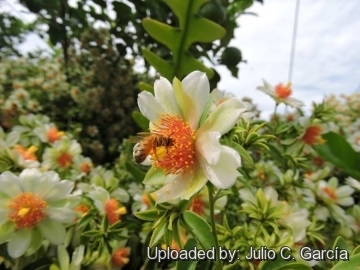 Description: Pereskia aculeata is a shrub, at first erect, but the branches often long, clambering, and growing to 10 m tall in trees. Like other members of the genus Pereskia, these plants are unusual cacti with spiny non-succulent stems and large leaves. 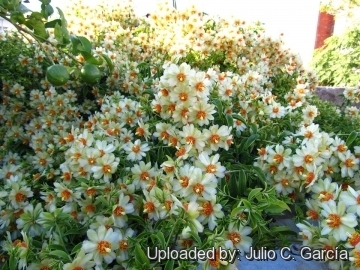 In tropical America the plant climbs over walls, rocks, and trees, and at flowering time is covered with showy, fragrant blossoms, followed by beautiful clusters of yellow berries, but its strong, almost offensive odour makes it objectionable for growing near habitations. This species consists of several races, differing in shape and size of the leaves and in colour of the flowers. Stems: Scrambling vine s 3 to 10 meters long and 2–3 cm thick. Leaves: Short-petioled, simple, entire, lanceolate to oblong, or ovate, short-acuminate at the apex, tapering or rounded at base, 4–11 cm long and 1.5–4 cm broad, and deciduous in the dry season. Spines: Spines in the axils of the leaves of younger stem, paired, rarely in threes, short, and hooked. Spines on older, lower part of stem solitary or 2 or 3 together, slender, woody and straight. Flowers: Numerous in panicles or corymbs, white, pale yellow, or pinkish, 2.5 to 5 cm broad strongly scented; ovary leafy and often spiny. Fruit: A rounded berry, translucent white to light yellow, orange or red, 1.5 to 2 cm in diameter, when mature quite smooth. The fruit are also edible, containing numerous small seeds. It somewhat resembles the gooseberry in appearance and is of excellent flavour. Seeds: Black, somewhat flattened, 4 to 5 mm in diameter; hilum basal, circular, depressed, or crater-shaped. 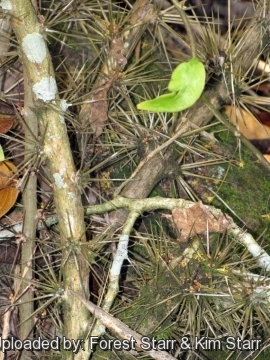 Pereskia aculeata Mill. : has long, clambering stems and growing to 10 m tall. 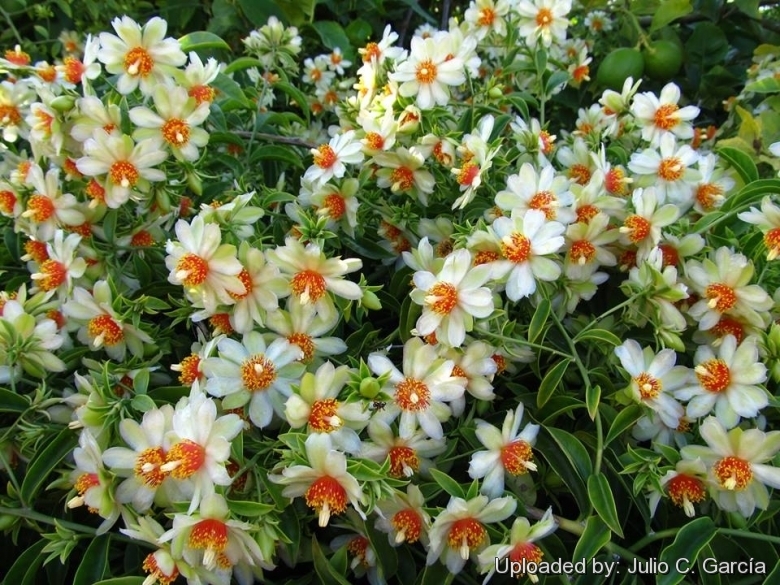 Has showy, fragrant blossoms, followed by beautiful clusters of yellow berries. Distribution: most parts of south and central America, Caribbean, Florida and Mexico. 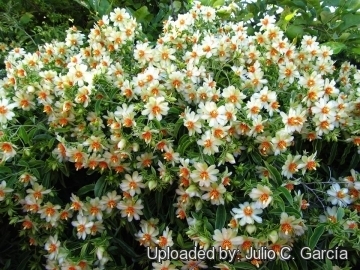 Pereskia aculeata cv. godseffiana: has salmon-yellow leaves with the underneath side a pinkish-purple. 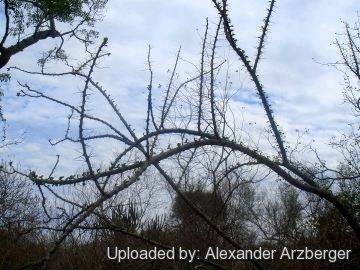 5) Ulises Guzmán, Salvador Arias, Patricia Dávila, “Catálogo de cactáceas mexicanas” Universidad Nacional Autónoma de México, Mexico 2003, p.114. 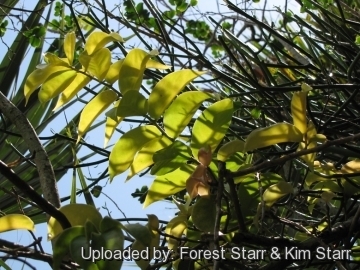 12)Forest & Kim Starr “Pereskia aculeata (Barbados gooseberry, leaf cactus)”. Plants of Hawaii. <http://www.starrenvironmental.com>. Downloaded on 20 August 2014. 13) Taylor, N.P., Zappi, D., Braun, P. & Machado, M. 2013. Pereskia aculeata. The IUCN Red List of Threatened Species 2013: e.T46508A3006142. http://dx.doi.org/10.2305/IUCN.UK.2013-1.RLTS.T46508A3006142.en. Downloaded on 16 July 2016. 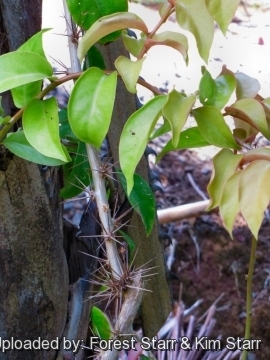 Cultivation and Propagation: Nearly indestructible, Pereskia aculeata requires full sun or light shade (but withstand dense shade) and well drained soils, preferably rich neutral organic soils, but may tolerate acidic ones and is suited for tropical or subtropical climates but may survive very light frosts (if very short). of a pyramid. The leaves and fruits are edible, containing high quantities of protein (20 to 30% of protein in the dry leaf matter), iron and other nutrients, and it is a popular vegetable in parts of the Brazilian state of Minas Gerais under the name of ora-pro-nóbis. The leaves are used in green salads, or can be cooked. In rural Brazil, the leaves, stems and fruits are also used for food for animals.